Dr. Margaret Rutherford bills herself as a “Clinical Psychologist, Mental Health/Midlife Blogger.” (She also provides a handy response to the challenge of naming one good thing about Arkansas.) Just kidding. At any rate, I thought this post was so good, and so well-written, that I would just copy and paste it herein. I’ve taken the liberty of bolding those items that speak to me loudly. 8. Marriage is not the place for criticism. Or abuse. If it is found there, it will ruin any chance of true intimacy or trust and dissolve the hope that once might have existed. I’m now living year #25. So far. So good. Thanks for reading! 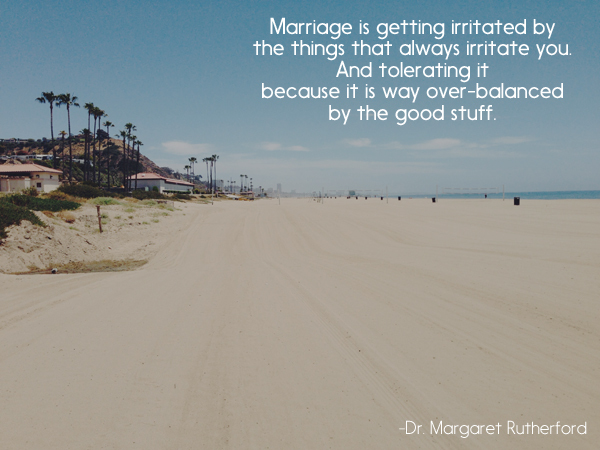 You can find more from Dr. Margaret at http://drmargaretrutherford.com! This entry was posted in Family, Marital Intimacy, Sacrament of Marriage, Submission, Temperament and tagged Catholic, Holy Family, Margaret Rutherford, Marriage, Marriage Blogger, Our Lady of Mt. Carmel Indiana, relationships, sacramental marriage by Bruce Allen. Bookmark the permalink.